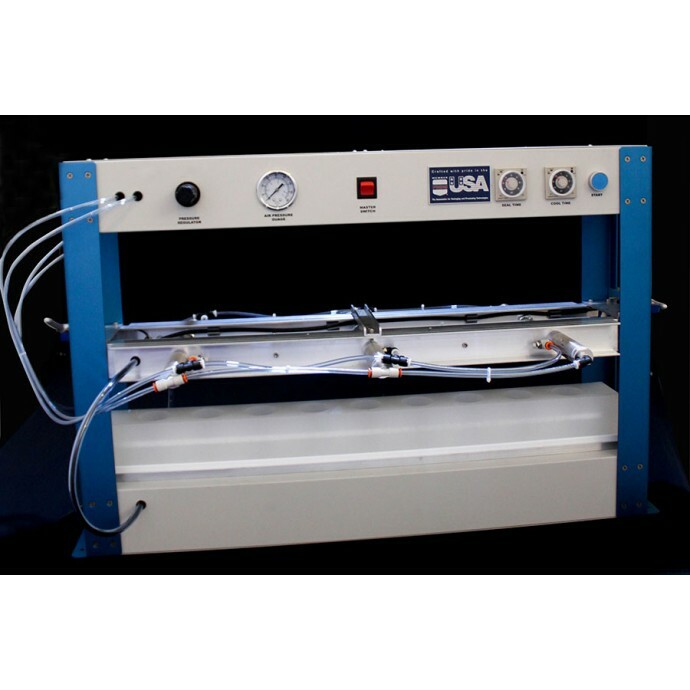 The MSTSS760 (TP-30) is an American made pneumatically operated tube sealer capable of handling up to 3,000 tubes per hour. The unique feed-through design makes it possible to remove tubes from either end, great when production lines are moved or changed based on the product being filled and sealed. 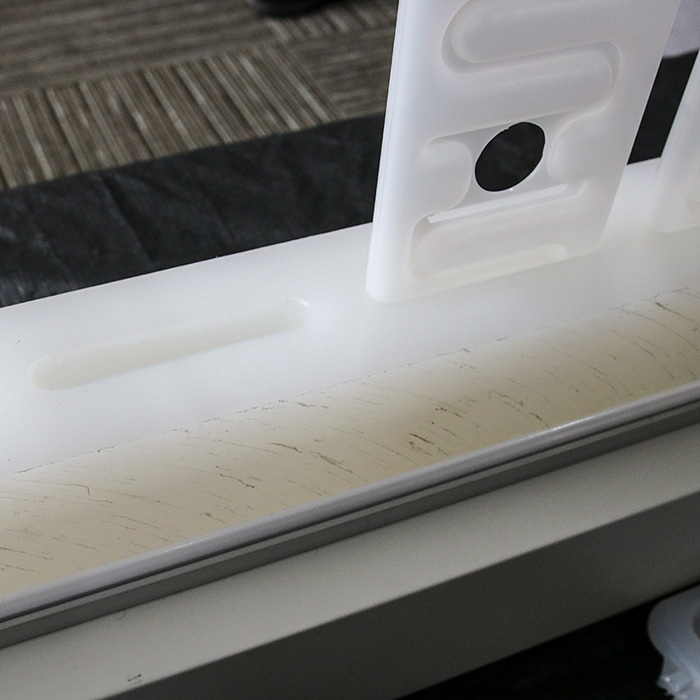 Want to make sure that you are getting the right sealer for your money? Contact our machinery sales department at sealersales@impakcorporation.com. 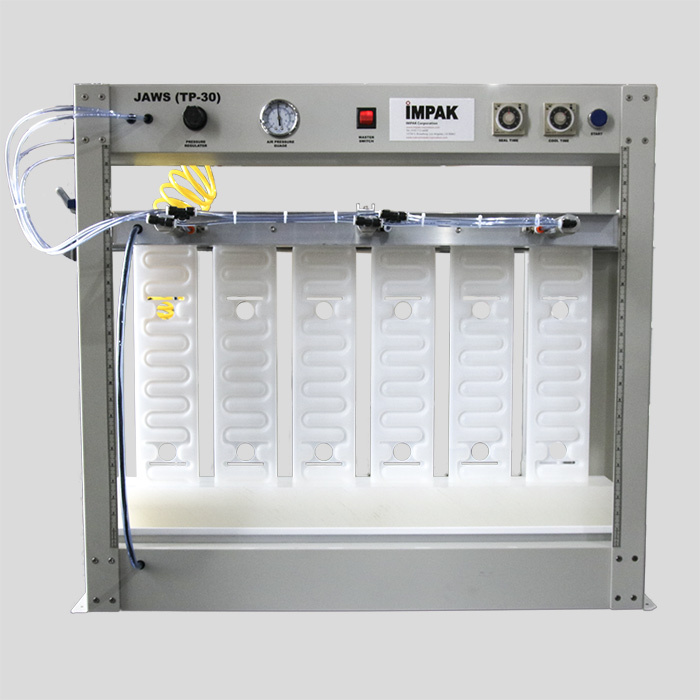 We have a limited supply of tube holders for your IMPAK Multi-Station Tube Sealer (model MSTSS760). Do one of these pre-drilled racks fit your tube size? Contact IMPAK for pricing and availability. To ensure proper fit we recommend that you send us at least two tubes prior to purchase. We will insert your tubes for fit in the rack and send you a photo with your tubes contained in the openings. Need to fill your liquid/paste product quick and precise? 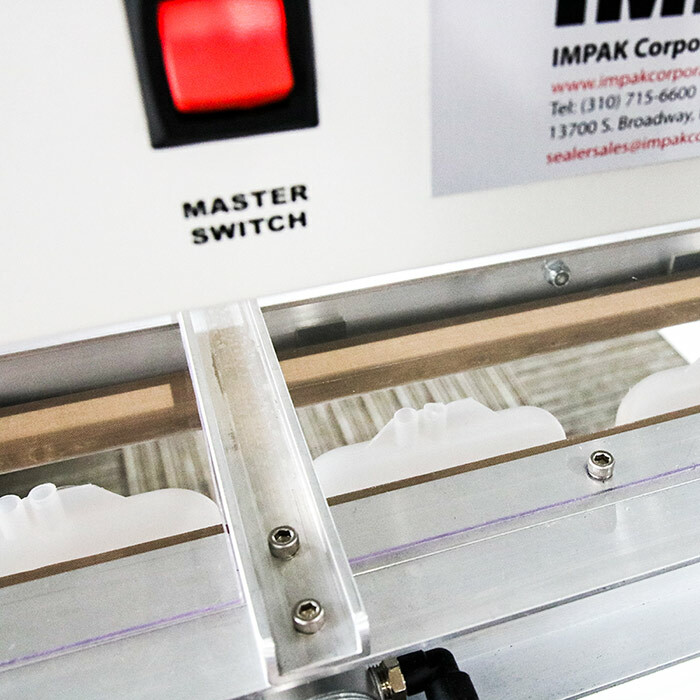 Example of how IMPAK can build production tube sealers based on customer-specific applications. In this case an upgraded TP-30 tall enough to accommodate Viking Cold Solutions' product, complete with a custom tube rack for increased production speed. The sealing system designed for Viking Cold Solutions is an excellent example of how IMPAK’s engineering group took the basic frame of the TP-30, a unit with a 30” wide seal bar designed for sealing multiple tubes, primarily for the cosmetic industry. They then increased the height of the basic unit and machined the product rack to be a positioning block for the product that is key to Viking Cold Solution. This allows the company that was previously filling and closing them one at a time, to now put them in a rack that holds six, dramatically increasing their production. Also known as Bi-Active Heat. This option is used to seal thick materials or materials that require a high temperature to seal. Typical applications for the Dual Element option include, tubes and flexible packaging used for products made with glycerin, oils or thick creams that can seep between the layers during the sealing process. This option refers to a toggle switch that allows the user to turn the second heating bar on or off on a unit that already has the dual element option. This option will convert the sealing unit from single element to dual element and back at the flip of a switch. This is extremely useful when sealing tubes of varying thickness, or when sealing different types of products on the same machine. In the United States, 110 volts of power is standard. However, in places such as South America, Europe, Australia, and parts of Asia, the standard is 220 Volts of power. This option allows the user to operate the unit where 220 Volts of power are available. he 220 Volt unit comes with a ¼” wide heating element. 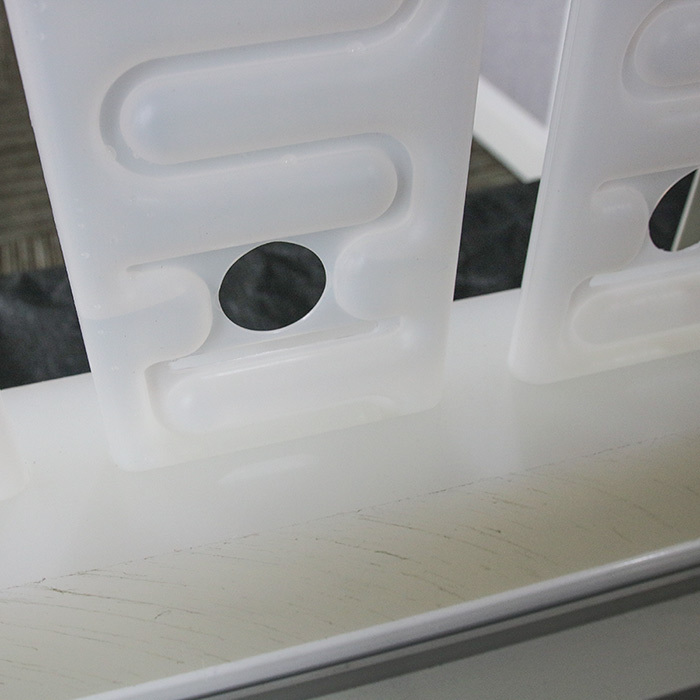 This option allows the unit to have a 5/8” wide heating element. This is used for aesthetic purposes or for larger tubes that require wider seals. This option is only available for units that work with 220 Volts of power. This self-contained water cooling and circulating system allows the user to cool the heating elements by using cold water. This option can dramatically increase sealing production by reducing cool down time. Note: for this to work, you must have the Bar Drilled Option for Water Cooling described above. The seal bars have been drilled to allow for air cooling. While reducing wait time and increasing production, this option is not as effective as the water cooled system. Custom cut tube racks made to the customer’s specifications. This allows the user to have multiple tube racks available for use. The use of multiple racks can speed up production time.